Music lovers from all over the world come to Carnegie Hall every January for The Song Continues. 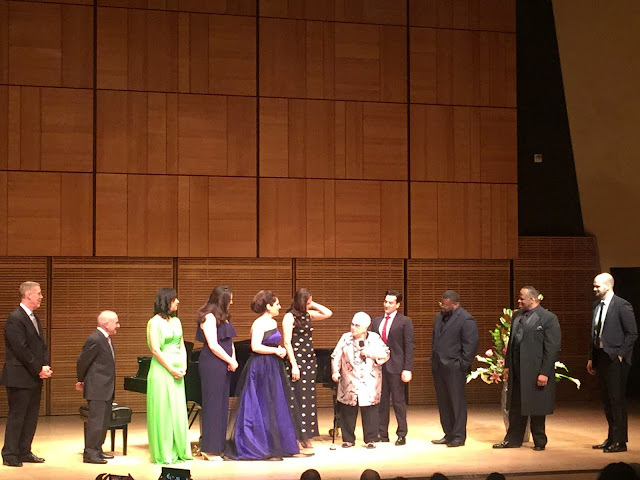 This year is Marilyn Horne's last year as artistic advisor; the celebration was a bittersweet one in which singers she has fostered heaped gratitude upon her but also shed some tears as well, as did members of the audience. Anyone who loves the art of the song owes a huge debt to Ms. Horne for going the full mile to see that this art form survives. We ourselves have attended The Song Continues for the past 15 years at Carnegie Hall. Before then we heard her young singers at St. Bartholomew's Church and before that at the Kosciuszko Foundation. We have lost count of all the incredibly talented singers to whom she has introduced us. But we will be eternally grateful to her for her devoted service to the field. For yesterday's celebration, eight splendid singers graced the stage of Zankel Hall and performed a program that only hints at the scope of art song; it held the audience spellbound for a good two hours, or should we say a wonderful two hours. If there were one quality all the singers had in common it was the ability to inhabit a song and turn each one into what Renée Fleming, in her master class of the prior day, called a "3-minute opera". These singers were all storytellers and did not rely solely upon their vocal gifts to entertain us. Rather, they used their artistry to pull us into the world of the poet and that of the composer. Opening the program was mezzo-soprano Beste Kalender who used facial expression and ample gesture to carry us to Reynaldo Hahn's Venice. She chose three selections from his Venezia. We loved the romantic "La barcheta" for its stunning vocalise and "Che peca!" for its wry humor. The songs were sung in Venetian dialect and delighted us thoroughly. Leonardo Capalbo has always tantalized us with his garlic-infused tenor and yesterday he introduced us to a trio of songs by Pietro Mascagni; we always love hearing songs that have been undeservedly neglected on concert programs. There was a lovely pianissimo in "Serenata" which was matched by pianistic delicacy on the part of the peerless Warren Jones whose artistry supported the four singers on the first half of the program. Mr. Capalbo invested the songs with dynamic variety. Baritone Edward Parks, whose performance of the role of Steve Jobs in The (R)evolution of Steve Jobs was so completely honest and believable, performed three songs by Charles Ives. "In the Alley" is a wry look at an unrequited infatuation-- and a lot of fun. Not so much fun was "General William Booth Enters into Heaven" which made us feel as if we were missing something. "Berceuse", on the other hand, showed off the lovely soothing quality of his instrument. Closing the first half of the program was the lovely Susanna Phillips whose soprano always gives us pleasure and whose interpretations are always spot on. She gave us three songs by Richard Strauss. "Muttertänderlei" is a cute song about an overly proud mother whose child is, of course, exceptional. The passionate "Cäcilie" was given an enthusiastic reading, but it was "Morgen" that brought us to our knees. Mr. Jones took a slower tempo than usual and played with an ethereal delicacy that created an otherworldly mood, causing us to question our assumptions about the text. We love an interpretation that shows us something new! Ms. Phillips' singing sustained the mood. For the second half of the program, Martin Katz took over as collaborative pianist. Soprano Nicole Cabell chose three selections by three different composers to show off three different styles. "Del cabello más sutil" is perfumed with sensuousness and comes from Fernando Obradors' Canciones clasicas españolas; it contains some marvelous melismatic writing, beautifully negotiated by Ms. Cabell. Henri Duparc's "Chanson triste" created a tender mood, and Ricky Ian Gordon's "Joy" gave the singer an opportunity to be more expansive. Ms. Cabell shows a deep understanding of what she is singing about. Lester Lynch has a big baritonal sound that we almost called baronial. There is so much power there that Mr. Katz could pull out all the stops without holding back. The voice is well suited to Schubert's "Gruppe aus dem Tartarus" and to Barber's "I hear an army"; but we preferred the tenderness he exhibited in Brahm's "Wie bist du, meine Königen", a lovely romantic tribute. Tenor Russell Thomas opened his set with Stefano Donaudy's familiar ode "O del mio amato ben", causing us to look at his bio to make sure he is a tenor. It sounded great but not nearly as tenorial as his performance of two Tosti songs which followed--"Non t'amo più" and "L'alba sepàra dalla luce l'ombra"--a memorable performance indeed. The program ended with the matchless mezzo-soprano Isabel Leonard singing a heartfelt rendition of "Take Care of This House" from Bernstein's 1600 Pennsylvania Avenue. Of course the song is about The White House which could use some care right now, but we also took it to mean caring for Carnegie Hall, our cultural house. She also sang "Greeting" from Arias and Barcarolles but when she got to the final selection "Somewhere" from West Side Story, she asked the audience to sing along with her--a capella! There were two notable encores: Warren Jones dedicated his amazing arrangement of Stephen Foster's "Beautiful Dreamer" (one of her signature songs) to Ms. Horne and the entire cast raised their voices in tribute. We have never appreciated the song so dearly! Mr. Katz also contributed an encore, Richard Strauss' "Zueignung". We do not want to leave our readers thinking that Ms. Horne is retiring or anything that unbelievable. Although Renée Fleming will take over the helm of The Marilyn Horne Legacy at Carnegie Hall, Ms. Horne will likely stay involved. Similarly, Ms. Horne is retiring as director of the voice program at Music Academy of the West but will stay involved there as well. When you are that large and generous a personality, you just can't stop giving!